My father is my 8th cousin. So, I’m not at all certain that it’s true that my father is also my 8th cousin, but it is entirely possible given my family history and the interrelationships between the Alberts, Michauds, Leguerriers and Gauchers over several generations. There is clear evidence that the Michaud and Albert clans came over from the Poitou area of France together in the mid 17th century. On my mother’s side of the family, the Leguerrier side, it seems that Guillaume was the first to arrive in Canada. He arrived sometime just before 1748. 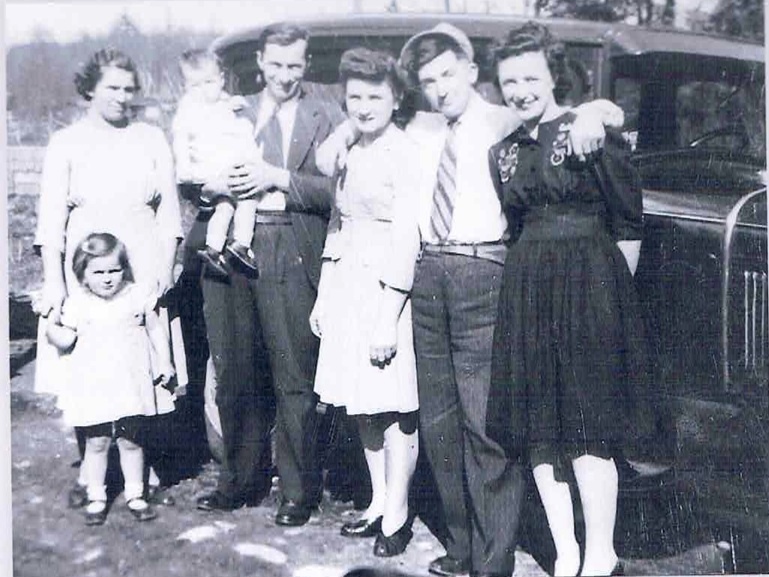 My paternal grandparents Thomas Albert and Edna Michaud are 6th cousins so it seems the families that appear most predominantly in our family histories intermarried frequently enough. Maybe as I get older I think more about my own death just because I’m getting closer to that time and time seems to be moving ever so fast. But I do glance away from my own belly button from time to time. I’m also fascinated with my family’s history, mostly as I try to imagine what my ancestors experienced as they lived out their lives. What would have possessed my ancestor Guillaume Leguerrier to leave his home in St. Léger, Normandy in the middle of the 18th Century? Among the possible hypotheses on the origins of the Leguerriers, there is one that proposes that the Leguerrier were originally from Switzerland and that they ended up in the Channel Islands of Jersey and Guernsey fleeing from religious persecution. Some of the refugees ended up back on the continent, in Brittany. One Leguerrier, it is said, left the Channel Islands to settle in Wales, about one hundred and fifty kilometers to the southwest of London. Certain contemporary  Leguerriers in France report that oral tradition has it that the Leguerriers had lived in Brittany but that in the 15th Century some had come to live in Normandy. At that point they abandoned the Breton language to adopt French as their language. As to their name, they simply translated the Breton word for their family name into French, which ended up as “Leguerrier”. The French origins of the Leguerriers in Canada are in St. Léger, Normandy, a tiny village situated at an altitude of 100 meters above sea level, at about 10 kilometers from Grandville and at about 18 kilometers to the north-east of Avranches in the Manche District. St. Léger is in the Coutances Diocese. The population is about 75 inhabitants [in 1974]. The ocean, about 7 kilometers away, is visible from St. Léger. Next to the church which is in the Norman architectural style there are a few stone houses, all occupied. Close by, in the south, at the base of a small hill flows the little Thar river that flows west towards the ocean where one can also find the partially restored ancient Lucerne Abbey. The first and only Leguerrier to come to New France was Guillaume Leguerrier. Madeleine, baptized on February 14th, 1720. Nouelle Leguerrier was godmother at a baptism in 1704. Catherine le Guerrier, wife of Claude Youffre, had her son Jean marry Jacqueline Pestour on September 30th, 1711. Pierre Leguerrier, priest, attended the burial of a 7 or 8 year old child. A Claude Leguerrier assisted in this task. Pierre, the priest, signed the register “leguerrier” and Claude, who has a nice handwriting, signed “le Guerrier. Jacques le guerrier, sieur of the ‘her Pierre berbière’ (?) is present at a wedding on February 17th, 1718. Julienne le toxa, wife of Jacques le guerrier, sieur of la her Pierre [whatever that means], is listed as godmother at the baptism as Julienne petoux, daughter of Jean petoux and Jeanne le terrier. Françoise le guerrier, widow of Robert le petour, who had died the day before, was interred on November 22nd, 1719. She was about 70 years old. There are currently Leguerrier in France who claim to be descendants of François, thus of Louyie or Ivan, Guillaume’s brothers. These Leguerrier claim that they are from St-Ursin, a tiny village close to St. Léger. As Guillaume was making his way to North America, one of his brothers established himself in the neighbouring village. The descendants of this brother include Victor Leguerrier, grandfather to several Leguerrier currently living in France. We note that there is another Victor Leguerrier living in Rennes, France. Finally there is a woman living in Switzerland who claims that her ancestors are from St. Léger. My sister, Claudette, has done a lot of snooping around the family tree and has published a number of calendars and booklets of family memories. distant cousins on my mother’s side, Victor Leguerrier, published a history of the Leguerrier family in Canada (1974), a very serious study of over 600 pages, and Marcel Lirette published Descendants of Antoine Micheau and Marie Train (date unknown- I remember getting my copy around 2005).